This is a relatively easy half-day hillwalk, to the highest of the Ochil Hills. These are the grassy rounded hills that rise up steeply from the Forth Valley, providing a striking backdrop to the west of Stirling Castle and the Wallace Monument for those travelling by rail or road from Glasgow to Perth. 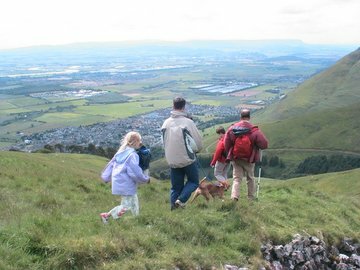 They provide a rewarding hiking trip, especially from the Hillfoots towns of Clackmannanshire. There are no significant difficulties on the walk, and this is one of the driest parts of Scotland so there’s a good chance of a clear view – sometimes made more spectacular by morning mist in the valley below. A word of warning – take care on the grassy descent – these hills have steep faces down to the south. Difficulty Suitable for anyone of moderate fitness with sturdy footwear. Getting there Car from Dundee. Shops, cafes and pubs in Tillicoultry and Alva, and the Woolpack Inn at Tillicoultry for a pint afterwards.